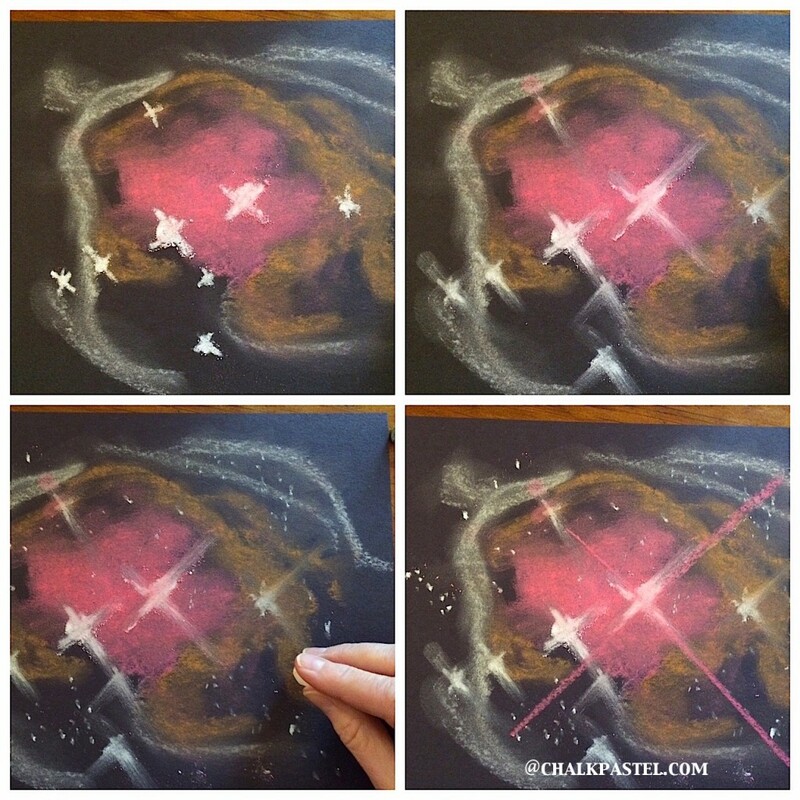 In honor of the astronomy studies you have enjoyed or any Star Wars fans out there, enjoy this space chalk pastel art tutorial! Space art is simply so beautiful. It is so easy to achieve gorgeous results with a few layers of color – just black construction paper and chalk pastels! Chalk pastels – dark pink, light pink, white, light blue, tan and white. Note: if you do not have these exact colors, simply use what you have. I promise it will be beautiful because each nebula is unique! Suggested supply: baby wipes or wet paper towels for wiping chalk residue. To begin, turn your paper horizontally. Take your dark pink, turn it on its side and brush an irregular shaped cloud of pink color in the middle of your paper. Next, take your finger and blend the color to make it dreamy looking. 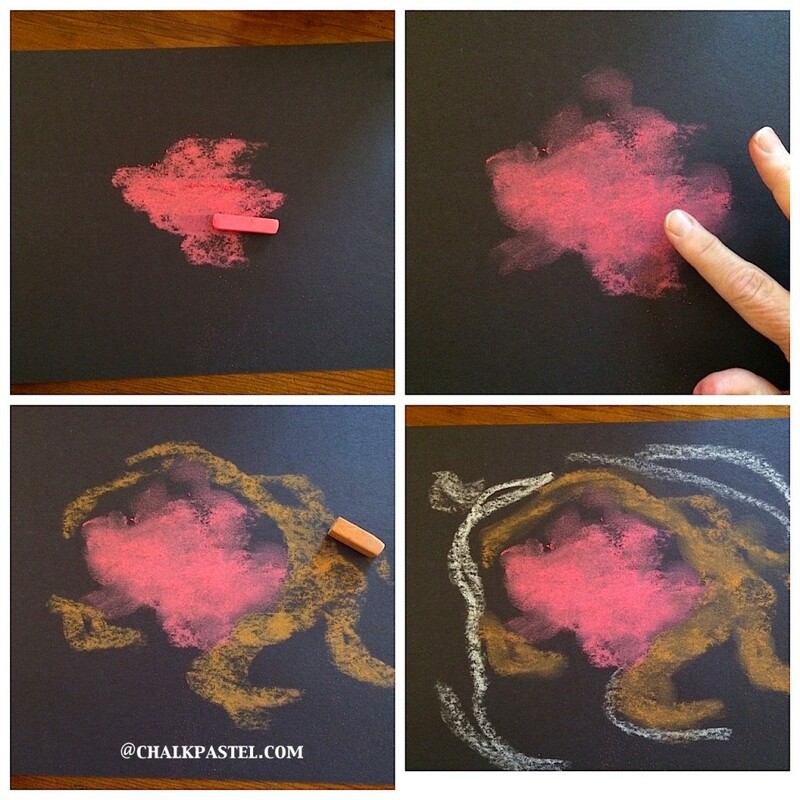 With your tan chalk pastel, make a sweep of color around your pink. Add some ‘arms’ of tan at the bottom. Do the same sort of outline with your white chalk pastel. Next is a fun part! Take your white and add some stars. Start by making large, white dots. Then put an X over each star. This adds a sparkling glow to your star. Take your finger and ‘pull’ the white color from each X, extending the sparkle. 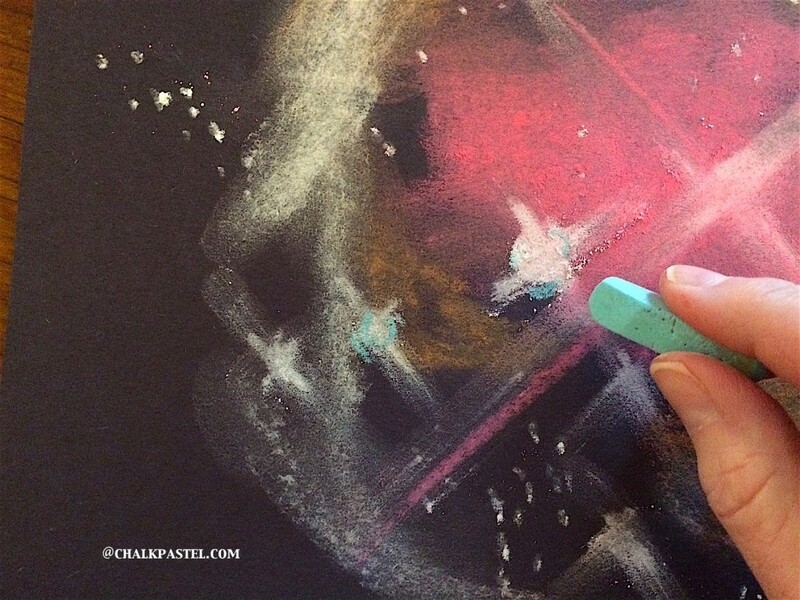 While you have your white chalk pastel, add some more stars all around. These are distant ‘dots’ of stars. 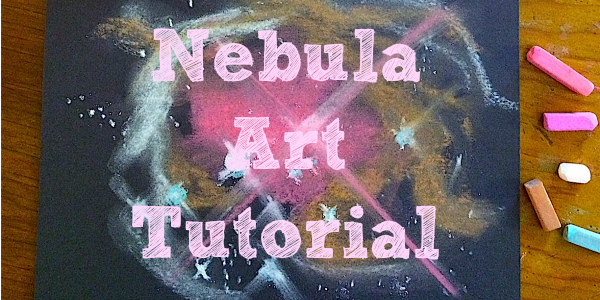 Now the focus of your painting is at the center of your nebula. Over the center star, add long lines of pink, extending almost to the outer edges of your paper. Take your finger and smooth out the pink for more of that dreamy look of space. The final, beautiful touches are made with the light blue chalk pastel. Just add a touch of blue around the round part of your stars. This highlights the ‘circle’ part and gives each of your stars depth. 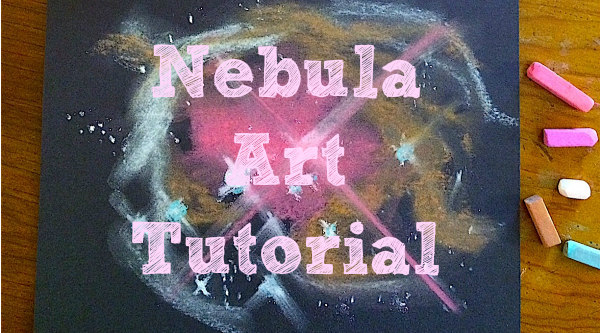 Blend and smooth any more of your chalk pastel nebula to carry on the soft look. What a beautiful space scene you have created! You might want to sign your name in the corner. You can even turn it over and give your painting a name. 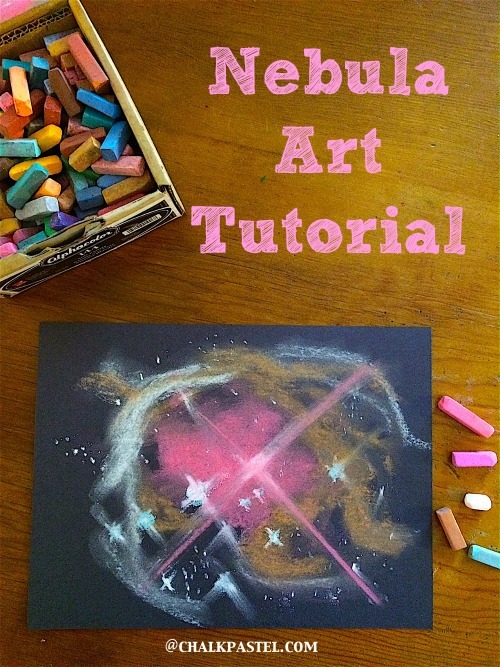 While you have your chalks out you may want to enjoy more of our space art tutorials… because you ARE an artist! Visit ChalkPastel.com to shop for chalk pastel ebooks and video courses. Follow ChalkPastel.com on social media for inspiration! Use #YouAREanArtist to be featured on social media! Now in her 15th year of homeschooling, Tricia faces a daily dose of chaos with five children. She and her mother co-author a series of Chalk Pastel art tutorials and curriculum for all ages. You can find 100+ free art tutorials and helpful homeschool habits at Hodgepodge. 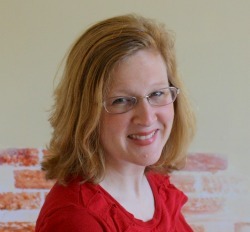 She and her husband, Steve, are also owners of The Curriculum Choice, a review website making homeschool decisions easy. Our very favorite art project (at least in terms of what we do most!) is to chalk the driveway. My daughters love to make elaborate scenes (sometimes even telling a story as it moves down the driveway). My favorite part is that it usually lasts a few day and makes me smile every time I walk outside, but in the end it isn’t something that I feel I need to store (although I usually take some photos). I notice my children are way more likely to experiment with the outside chalk because it isn’t as “permanent” as a piece of paper that mom may keep forever. All all time favorite – especially on these beautiful spring days! My favorite art project? I’m not at all artsy, so I usually just leave the supplies out and let them have at it – they love chalk pastels though! Ah… building a love of art! Painting is my favorite art project to do with the kids. Smart! We love to combine art and science, art and literature, art and history – too! We are enjoying your spring chalk pastel book at the moment. I love that all the kids can do it from the 4 year old to the 14 year old! That makes me so happy to hear – that is exactly what we aim for – art for all ages. Enjoy! Right now we are enjoying the adult coloring books! Anything! My daughter loves most any kind of art project and it’s fun to watch her excitement and creativity. My older son teaches my younger children how to draw! Our kids love to take white paper and paint illustrations to their audiobooks. I would love to introduce them to chalk art! Art is the subject with which I struggle. I have been stretching myself to include art this year. We have done drawing together, we color printable Bible verses together, and our most fun experience was learning to knit together. We made matching purses! My favorite art project with my children is “bubble art”. We fill a dishpan (or 13 x 9″ cake pan) with soapy water and use straws to blow lots and lots of bubbles. Then we drizzle a small amount of food coloring on top of the bubbles and carefully place a sheet of paper or card stock on top–for just a moment. The food coloring sticks to the paper in a beautiful pattern. We often use our *art* as wrapping paper for gifts. Grandmas LOVE it! My fav – just seeing them create! I was astounded when I saw my 6 yr olds Cross pic she did with my mom last Easter! Thanks to Southern Hodge Podge for such great tutorials! Our favorite art projects are the ones that leave my son glowing from within as he expresses his feelings and and how he views the world around us (even the things only he can see). It really makes me stop for a moment when I see the flower he is attempting to create and notice that he puts more focus on the ants trailing down the stem. Times like those cause you to realize that what we as parents deem important, may be viewed differently to our children. I love how easy chalk pastels are for my son to use. They are one of our favorite art supplies. We love watercolors and pastels! I’m partial to painting lately. But we like to explore a wide variety of mediums around here. Watercolor crayons, watercolor pencils, and tempera sticks are fun things we’ve just discovered in the last couple years, and those are favorites, too. My favorite art project so far was making clay ornaments for Christmas. Our favorite art projects involve simple pencil drawings!